Safety is one of the most important considerations on any jobsite. Ensuring that workers are sufficiently equipped and properly trained is essential to ensuring safety for everyone on the site. In addition, it’s important to take proper precautions for the safety and security of the window and doors being installed. 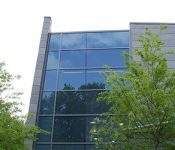 There are a few basic safety measures that should be taken when installing commercial windows and doors, as detailed in the most recent issue of Glass Magazine. We’ll discuss them below. When unloading, make sure that the truck or cargo are not positioned so that the windows and doors could fall toward or onto the installer or the ground. After the products have been unloaded, unwrap the windows and doors, verifying that they are the correct type and size. Inspect them for damage. If any damage is visible, fix or replace the component before demolishing the old window. Stand windows and doors upright – never stack flat on the floor and on top of one another. Make sure products are stored in a secure location, away from sun, moisture, wind or other forces that might cause them to blow over or become damaged. Don’t remove packaging until directly prior to installation. 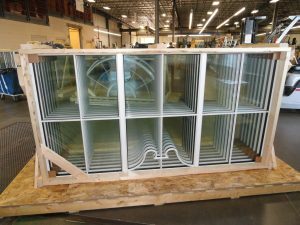 Some products include spacers, banding, or other packaging that can’t be removed until after the window or door is installed. Follow the instructions closely before removing these items. After the windows have been installed, clean them with mild detergent and warm water. Avoid harsh chemicals and anything sharp. Remove temporary labels but leave permanent safety labels. Finally, make sure all windows, doors, locks and other components are operating correctly before leaving the jobsite. At St. Cloud Window, we are committed to helping our customers install our commercial windows and doors safely. On our website, we provide installation and care instructions for every project. 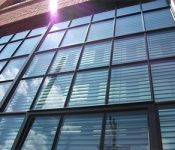 Check out our full line of commercial aluminum windows, and get in touch to learn more about any of our high-performing window products.